Still Seeking Sanity: WE'RE HOME! WE'RE HOME!!! I am so excited to report that we brought baby drew home today! We are thrilled to be home, the family feels complete now. 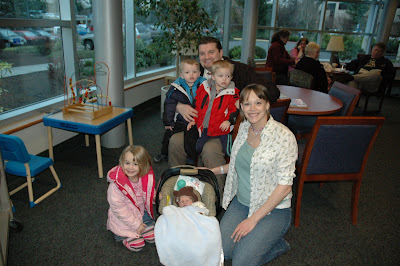 We were discharged around 2:00, I had to wait a little bit for Marty to get home from work and grab the kids and head in, Emma came into the nursery with me to get Drew, and Marty stayed in the waiting room with the boys. We loaded up and headed home, and got here about 4 o'clock. On the way home, Emma told me that when we have another baby, we won't name him until we see what he looks like. I almost drove off the road, but got over it and calmly told her that we are probably not going to have another baby, our family is complete now. She really didn't understand why till I explained that the van is full, so there is no room for another baby. Then she was OK with it. I'm glad that all these new babies are not having a negative effect on her! 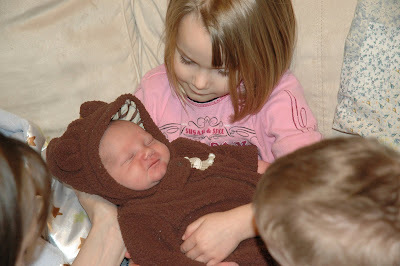 The kids are excited and keep fighting over who gets to hold him. 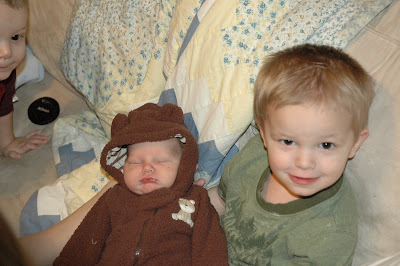 Grant especially loves holding "beebee dwoo" and both the boys have been kissing him to death. They are very much in awe of their new brother, I hope this fascination lasts! 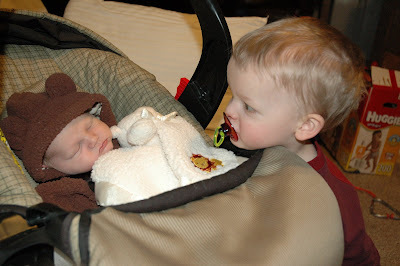 I realized that I do not have a bassinet, or any other place to set Drew down in the living room. He is presently sleeping in a laundry basket lined with blankets. Poor fourth babies, they get no special accessories! We still have not taken down our Christmas tree (I know, but things got crazy!) but when that comes down I will bring in the bouncy seat and get ahold of a bassinet. For now, the laundry basket will do. Well, Drew wants food, so I'll be back tomorrow! Yay! So glad he's home! My brother slept in a dresser drawer so I don't think a laundry basket is a bad thing!!! Love ya and can't wait to come visit!! I love the pictures! Grant sure loves his bubbas Benji-ben and dwoo. I don't think I have ever seen that particular look on Grant's face before. It must be his "Drew" look. He seems so proud! Love the picture from the hospital. Where is the orange shirt and pink sox. I am so happy for you guys and I am glad to hear that andrew is home and doing good. My daughter has that same bear coat. It's so cute, I'm going to be sad when she outgrows it! Congrats on your little one. He is beautiful! So glad to hear the Drew is home and doing well. LOVE the picures!! So beautiful! !